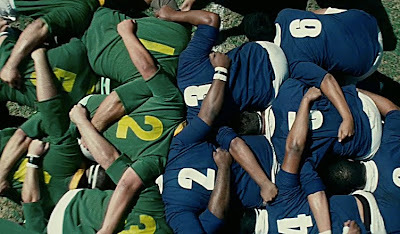 Invictus, Clint Eastwood's tale of post-apartheid South Africa's momentary unity with the success of the national rugby team, could be described many ways: slight, obvious, familiar, underwhelming. Despite running well over two hours, it's not very weighty and even as characters give too much time for exposition the movie can be difficult to follow (and not just for those unfamiliar with rugby or the Afrikaaner accent). It's another entry into that disreputable genre, the feel-good true-life sports film, yet lacking in many of the tropes of that genre - we don't really get to know the team members, the games themselves (except for the last one) fly by in a few quick montages, and the main character is not even an athlete himself. Invictus sometimes gives the impression of a just-add-water "Instant Genre Film" mix in which someone forgot to add the water. Most of these drawbacks have a double edge. The light quality of the movie means that it's often economic, unpretentious, and unassuming. Eastwood's much-touted working technique (don't tinker excessively with the screenplay, shoot things in one take if possible, leave out the frills) leads to a productive output but often has mixed results onscreen. His work occasionally has the air of sloppiness, carelessness, a kind of rushed economy which eschews fine-tuning. But, yes, this approach has its charms as well. Particularly in an era where movies are slicker and emptier than ever, it can be pleasing to experience a mainstream movie with rough edges, one that does not go down smoothly and indifferently but sticks in the throat here and there. Besides, the director has a more serious Achilles' heel, emphasis on "serious." Many acclaimed Eastwood pictures of the 00s, Mystic River and Million Dollar Baby in particular, drowned in a sea of weepy somberness. Their humorless self-pity sat uneasily next to some of the sillier narrative contrivances and unsubtle directorial touches. Invictus, while not without sentiment, is an altogether more pleasant experience. In this it is anchored by Morgan Freeman's performance as Nelson Mandela. Freeman has just the right mixture of gravitas and comfort in his own skin, and unlike the histrionic Penn or mopey Eastwood in the previous films, Freeman's good humor allows the movie to float along unsullied by the languorous morbidity of past Eastwood efforts. The sun and palpable warmth of the climates on display here may also help in that regard, fairly or not. Invictus gives the impression of plain prose, with a pleasing aftertaste. Its screenplay, taken in isolation, is not inspired but by taking this at face value, without trying to force anything additional out of the material, Eastwood cultivates a nice menagerie of effective little scenes, ruminations and associations which inevitably arise from the scenario, and relaxed, effective performances with enough breathing room to enable the appropriate comfort level. Matt Damon doesn't do as much with his limited role (as team captain Francois Pienaar), but he doesn't need to. He's perfectly cast as the quietly awe-inspiring, rugged young athlete; a few years ago, a random Boston poll asked whom locals preferred, Damon or Ben Affleck. Guess who won hands down? (Affleck seems to have improved his lot by stepping behind the camera.) Few other movie stars so convincingly give the impression, onscreen and off, of being such a heads-down, unpretentious hard worker; as such, Damon is a natural in the role. The film chugs along, stripped of many (if not all) unnecessary subplots. The team's one black player is out with an injury and eventually returns, yet this development is barely acknowledged. Quite thankfully, Pienaar's wife (Marguerite Wheatley) is not forced into the ritualistic jealous-spouse role, and Wheatley registers an appealing, unforced presence in her brief onscreen time. The film's scope remains resolutely national and even international - Invictus' only real subplot being the tension between the president's black and white security guards which, of course, has national implications (not only as a metaphor). Eastwood ultimately satisfies by not adding that water to the recipe, by letting the film remain sparse and yes, occasionally somewhat rote. All that's left is the machinery of the come-from-behind sports victory and the sociological paraphenalia cluttered around it. Finally, Invictus is inspirational, but in a curious fashion. Its inspiration is melancholy, barely even bittersweet: South Africa's moment of triumph was Mandela's release and electoral victory, not what came afterward (AIDS, continual grinding poverty, waves of crime). By setting itself after the climax, the movie cannot escape the inexorable sense of disappointment, nascent disenchantment, persistent difficulties mundane and otherwise. The national attachment to a rugby tournament carries an air of wistfulness, as if everyone knows it will not resolve tensions or solve the country's nasty issues with poverty or crime - the beauty is in the gesture, not the outcome. Above all, it makes one nostalgic for a certain flush of international optimism, an intangible flavor in the air during the 1990s, especially the early part of the decade. True, the nineties had their Gulf War, their Bosnias, their genocide in Rwanda. But we too have had our genocides, our own ethnic strife, and yes, our very own Gulf Wars too - far more intractable and deadly. What we have not had is the same sense of liberation which the collapse of Soviet communism and South African apartheid accomplished - that feeling of stepping out into the sun and stretching our arms and greeting the crisp morning air with cheerful resolve. We came close, at least in the United States, a couple years ago, but that jubilation was already colored by a grim sense of the challenges to be faced. The hope that such challenges could be met with the spirit of the cheerful warrior has fallen by the wayside since then. Invictus, with its exuberant African choruses on the soundtrack, its gritty but determined attitude towards challenges and tensions, its sense of a global springtime in which humanity has breathing room to improve itself, may fill one with a sense of longing. We may wish we could freeze everything, as the movie can, in that moment of triumph and bask in its glow forever. Nice review MovieMan. As I said elsewhere, only Eastwood could have gotten away with this kind of unbridled romanticism. The Rugby scenes are so well done that even a tussle looks like the gesture on the Iwo Jima monument. But then, Eastwood seems to have our-sourced the third act to his second unit director. And also those awfully expository lines. I think he can get away with it because he's so laconic about it, at least in this case. (He seems to handle optimism more tastefully and stoically than sorrow.) And if anyone can sell an expository line, or at least come close to it, I guess it's Morgan Freeman. I didn't like this one. And for someone who loves Freeman I REALLY did not like him in here. It was as if he was on autopilot but someone forgot to put in the batteries. But I didn't expect to like it, Mystic River remains as the Eastwood piece I like (in fact I LOVE it) and I'm a fan of the divisive Changeling despite its faults. But that's about it. Didn't see Changeling, or Gran Torino for that matter, though the latter's trailers certainly seemed to confirm my suspicions. I'm not sure how many of those films you mention have hit DVD in the States yet, but if/when they do, I'll try to review them on this site. Most of them I'm curious to see for one reason or another. Peter Jackson is another director who drives me up the wall, so I don't have high hopes for The Lovely Bones, butu I am intrigued.